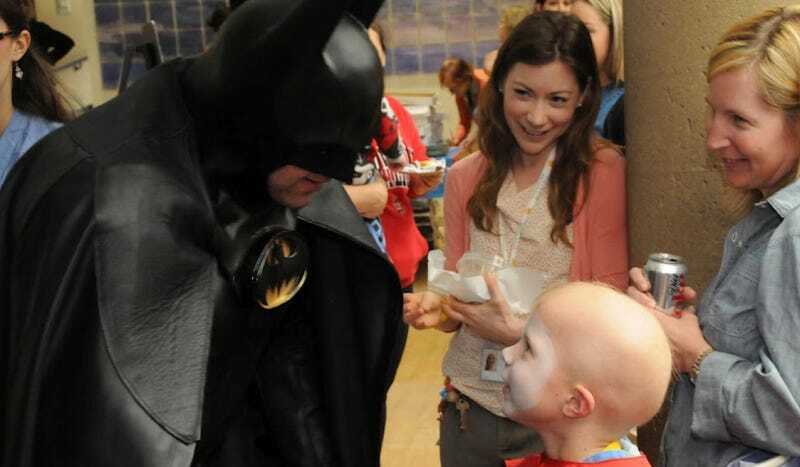 Lenny Robinson, who may be better known as the mysterious Lamborghini Batman, brings joy to countless children each year when he goes to Virginia area hospitals in full Batman gear and visits with some very sick kids. It's a great way to brighten their days, but one Chicago-area hospital abruptly cancelled Lenny's visit. Not cool. Instead of a Lamborghini, Lenny is now traveling the country in an awesome Batmobile replica. The Robert H. Laurie Children's Hospital in Chicago cancelled the visit because they believed it could be upsetting to children and parents in the wake of the Colorado massacre. This senseless act of violence has nothing to do with the Warner Bros' Batman franchise. At the heart of the movie is a central heroic figure that gives hope. The shootings in Colorado was a tragic event, but will not stop me from portraying Batman. I will continue to portray this iconic superhero, giving courage to sick children around the world that need it most. Hopefully other hospital's on Lenny's journey don't make the same decision. He's out there doing something great.